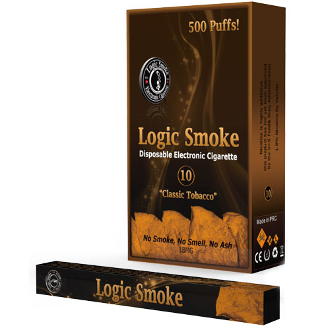 Our Logic Smoke USA Mix Flavor Disposable Electronic Cigarettes is full of flavor and oh so smooth reminiscent of your favorite red USA cigarette brand. Hands down American Cowboy tobacco flavor. USA Mix is a great tobacco flavor for anyone who is searching for a certain cowboy favorite. Numerous e-cigarette smokers swear this flavor is even better than the real thing. This top of the line Disposable electronic cigarettes from Logic Smoke has the newest technology. Made up of a cartomizer filled with the best e-liquid and a lithium ion battery; this comes completely charged and ready to go. There is no maintenance involved at all with this disposable e-cigarette. Just open, remove the sticker from the vent hole and start puffing. Its soft tip gives added feelings of smoking a regular cigarette and it is light weight and comfortable to hold and use.